What I want to do in today’s post is share 10 cool facts about the history of the 4th Infantry Division. My first duty assignment as an Active Duty Army Officer was with the 64th Forward Support Battalion, part of 3rd Brigade Combat Team, 4th Infantry Division at Fort Carson, Colorado. I spent three years serving in the division and to this day, some 10+ years later it’s still some of my fondest memories. I was very proud to wear the IVY patch and be part of this time tested unit. Deploying to Iraq during OIF 1 with the 4th ID was the highlight of my military career. In the paragraphs below, I will share a few cool facts about the division, to tell you more about the unit history. It traces its roots back to December 10, 1917 when it was originally formed at Camp Greene, North Carolina under the command of Major General George Cameron. As of January 2015 it consists of a Stryker Brigade Combat Team, 2 Armored Brigade Combat Teams, an Infantry Brigade Combat Team, a Fires Brigade, Aviation Brigade and Sustainment Brigade. As of 2015, 18 Soldiers from the division have received the Congressional Medal of Honor, including Theodore Roosevelt, Jr. the eldest son of President Teddy Roosevelt. The 4th Infantry Division has more than 25 campaign streamers to include St. Mihiel (WW1), Meuse-Argonne (WW1), Normandy (WW2), Rhineland (WW2), Tet Counteroffensive (Vietnam) and the Liberation of Iraq (OIF), to name a few. The division was inactivated on September 21, 1921 at Camp Lewis, Washington and was reactivated on June 1, 1940 at Fort Benning as a motorized division, part of the 1st Armored Corps. It was inactivated again at the end of WW2, on March 5th, 1946 and then was reactivated at Ford Ord, California on July 15, 1947. It’s played an important role in World War 1, World War 2, the Vietnam War, Iraq War and Afghanistan. During WW2 4,097 Soldiers from the 4th Infantry Division were killed, 17,371 were wounded in action and 757 eventually died from their wounds. A patrol from the 4th Infantry Division was the first ground force to enter Germany during World War 2. From 1950 to 1956 the 4th Infantry Division returned to Germany and stood strong against the communist threat to Western Europe. The bottom line is that the 4th Infantry Division has a proud history. It’s served an important role in many wars and conflicts dating back to World War 1. 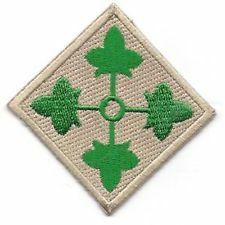 If you know any cool facts about the 4th Infantry Division, or have served in the unit yourself, I would love to hear from you. Please share your experiences and war stories with the rest of us by leaving a comment below. It is very cool to hear the history behind different divisions of the United States Army. I never knew that Teddy Roosevelt’s son received the Medal of Honor. We can learn so much from history. It would be neat to go through finding similar facts about all the different Army divisions. I wonder where a person could discover all this information? It is my opinion that any soldier should always know the history of the division they are in. If you don’t know it, I suggest you research it and learn. It can help you have more pride. Yes, soldiers should definitely know their own division’s unit history. Where can a civilian such as myself find information such as this on all infantry divisions? I was thinking that it would be fun and an educational experience to do a book on the histories of each and every division. I believe books such as that would sell very well. It would be kind of like an encyclopedia of Army divisions. Do you have any idea where I could find that sort of information? This is a really cool list. It’s so good to hear about other, possibly less famous, divisions and I love military history. #9 (first on the ground to enter Germany during WW2) is especially cool. What a great honor! Also, very cool to hear about a semi-famous member (Roosevelt). That was truly the great generation. Practically everyone served because it was the right thing to do. Could you imagine a celebrity serving today? I wish some would– it would be good for everyone. Thanks. I really enjoyed my time in the 4th ID. Great unit and great history.